A million bricks! What does the story of our church family have to do with this? 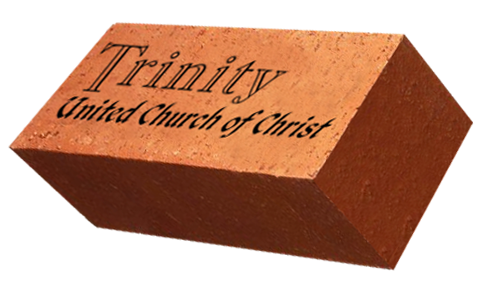 Though Trinity United Church of Christ had its origin two years before the signing of the Declaration of Independence (1774), it is the "brick story" which most clearly portrays our identity. In 1832 just one mile southwest of our present location, a local farmer fired 1,000,000 bricks for the construction of the new church building. This alone was no small task. But the next step, transferring them to the construction site, was where creativity and determination forged a new identity. One by one each brick was passed hand to hand. One by one, church members and friends transferred the bricks, spanning the mile distance between kiln and construction site. All 1,000,000 of them! No doubt there were plenty of hay wagons donated by members and lots of elbow grease to load and unload. Do the math. The situation demanded it. But the essence of the story is clear. It is a story of cooperation. A lesson in partnership. We celebrate the many parts that make up the one body of Jesus Christ (those within our own church family and those ecumenically) and the unique blessings which each person can bring! Space for a Variety of Service Groups which address local needs within the context of our wider community. Pastor - Reverend Rodney W. Wells, M. Div.